The Days of Johann, an agility dog! : New Squidoo Lenses: The GoPro for your dog, comfy collars for ouchs, how dogs shake and drink! New Squidoo Lenses: The GoPro for your dog, comfy collars for ouchs, how dogs shake and drink! We've put together a few new Squidoo lenses in the past weeks and wanted to share them with you! First up is we created a page all about how fun the new GoPro camera is for dogs! Get a GoPro camera for your dog! tells you all about how you can capture great photos and videos from your dog's perspective! GoPro cameras are the hottest cameras on the market for sports enthusiasts! They are used by more professional athletes, sports filmmakers and core enthusiasts than any other camera in the world. And they are very affordable! And the cool thing is that they make great cameras for dogs who like to be out doing their thing - whether it be hiking, swimming, kayaking, diving, fetching, or just running around having fun being a dog! 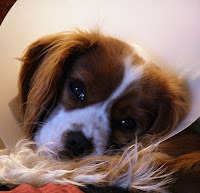 Next up is our new lens about Comfy alternatives to the dreaded Elizabethan collar cone for dogs! There is nothing worse than an ouch! And to make it worse when you leave the vet's office they often give you one of those dreaded plastic Elizabethan collars to wear to leave your ouch alone, making your dog feel even more uncomfortable. But there are some pawsome alternatives on the market, and some that you can make from reused materials, that will help your dog heal up nicely and be comfortable at the same time. Next up! Dogs are fascinating, there's no doubt about it! And how we drink is one of the most fascinating things about us. We walk up to our bowl, lean down, and magically lap up an unbelievable amount of water in a short time. But how do we do it? Well, it seems we're pretty efficient in how we lap up the water of life! And contrary to popular belief some say that we drink just as elegantly and efficiently as our nemesis, the cat. You can learn more in my Learn how dogs drink! lens. An d last but not least! After a good dip in the river, I love giving a good shake. If you have a dog and have given them a bath, you know how much they just can't wait to shake off the water. Seems that scientists have discovered that there is a correlation between the speed at which a dog shakes and the size of the dog. Who knew, right? Look closely with those GreatEyeglasses.com for eyeglasses and you'll see. Read on to learn more about how a west dog shakes to dry off.